Is my Child Ready to be out of a Booster? The Vermont Child Passenger Safety Program currently has several New (Free) Child Passenger Safety Technician courses. The new technician course is a 4 day course that leads to national certification. Join over 100 dedicated CPS technicians around the state ensuring the safety of children in vehicles. CPS technicians work in a variety of settings including; Fire and Rescue departments, Police departments, Hospitals, Day care centers, Pediatric offices, or are just dedicated community members. CPS technicians and instructors use their considerable knowledge and expertise at a variety of community-based activities, such as child safety seat checks, where parents and caregivers receive education and hands-on assistance. In order to become a nationally certified child passenger safety (CPS) technician, you must be 18 or older and pass the CPS Certification Course. 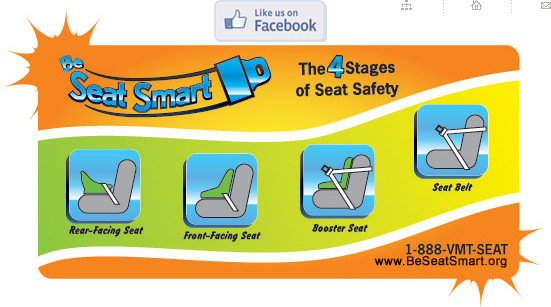 ©Copyright 2019, BeSeatSmart.org. All rights reserved.